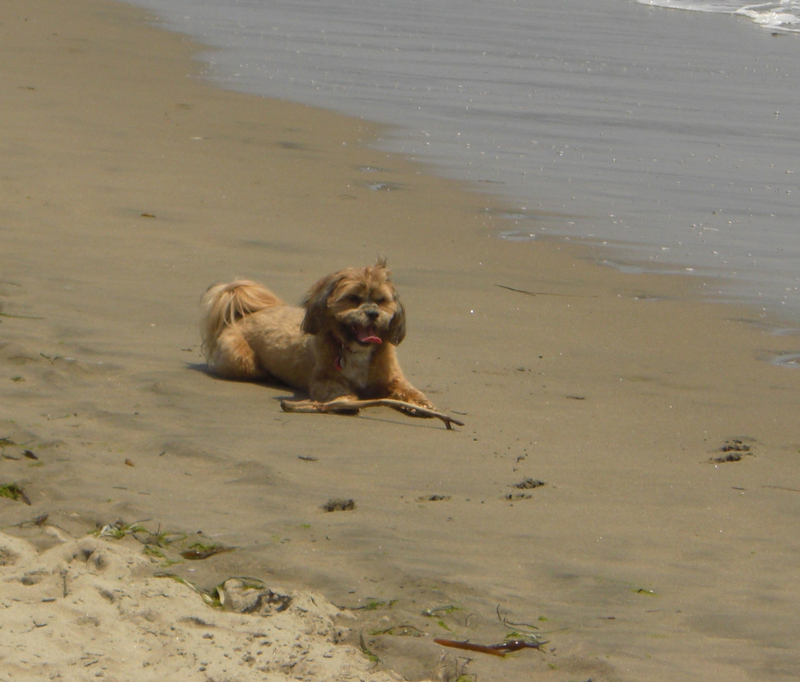 We moved from Morgan Hill on Sunday to enjoy the cooler temperatures and ocean breezes at New Brighton State Beach. This is one of my favorite places to camp. Our site is off the ocean but I can see the water from the front window and at night you can hear the waves. I will be here all week on a true vacation and Paul will return to Stockton on Monday to work returning to the beach on Friday night. I am truly enjoying my RV and the ocean this week. 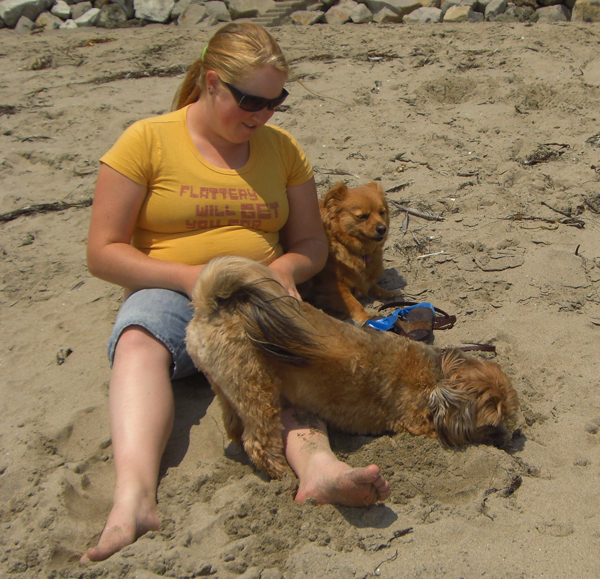 Each day the dogs and I go for several walks around the campground and then down on the beach. Duke really likes the beach and especially chasing sticks and burying them – not sure what that is all about but he is having fun. Allie is with me this week also and she just follows along wherever we go. Getting down to the beach is a pretty good hike all down hill so the return is really painful. Allie and I need to stop several times to check the scenery along the way! Tuesday evening I got to play a round of golf at De La Veaga Golf Course in Santa Cruz. My friend from San Jose joined me and we golfed with her brother and his mens league. It was a beautiful course and the men were very kind! Wednesday I had company for the evening and we went to a great mexican restaurant right on the beach! Dinner was great and the service was excellent until our waiter dropped a ceramic plate on the tile and it shattered and blew around the restaurant! A chunk of the plate hit me right on the cheek and of course my first thought was I am going to bleed and make a mess! Luckily that didn’t happen but it was scary! The weekend brought my family to visit and we had a wonderful time. Sunday was time to pack up and get back to Stockton and work on Monday. Just think in a few short months we won’t have to pack up and go home! We have had our first trial of living in the motorhome while working, playing etc. Saturday before the 4th we moved the RV into Coyote Creek RV Park in Morgan Hill where our friends, Mike & Claudia Sanford have been there workamping for the past several months. We stayed for 1 week and commuted to our respective jobs. I spent the most time at the park and both girls were able to visit and pretend like our family has a home (sort of!). That has been the hardest part about the transition is not being able to be together as a family which we usually take full advantage of during the summer months. We did all the usual things like watch tv, cook, clean, laundry and Denise even got in two sessions of water arobics. 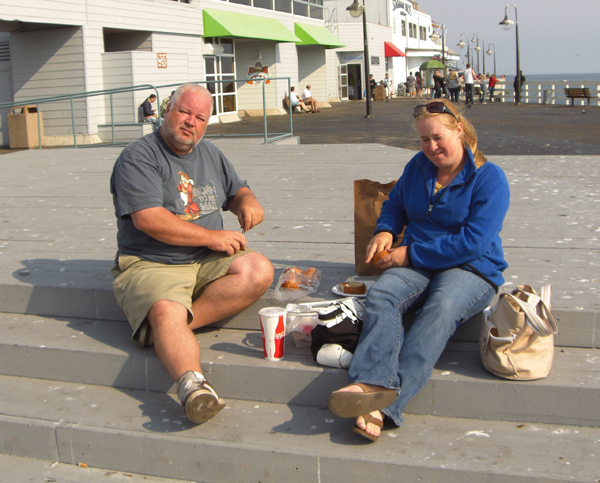 These RV parks are set up for long term stays and we met many great people that live in their RV and work. On Saturday, July 5th Paul & I golfed with Mike at the Gilroy Municipal golf course. The scenery was amazing, the golf was ok!! Then we got back to the park in time for a barbeque hosted by the RV park! Free beer and hot dogs if you are staying at the park! Both girls as well as our old neighbors were able to join us. Pretty amazing, I can still have people over to hang out and I didn’t even have to plan a thing. I am starting to really enjoy this lifestyle although Paul and I agree we are going to have to learn to pace the alcohol. Everyone wants to have a drink with you and that could lead to way too much consumption. A lot has happened and I promise I am going to get with this blog thing. Things have been really busy even though we no longer have a home. We are moved in and settled at our respective homes; both girls are living in one bedroom with our amazing friends who now are truely family! We thank them for all the compromises they have made for us. Paul is very comfortable in Stockton while I continue to split my time between San Jose and Stockton. I drive most of the time. My first time commuting on the ACE train, the train was delayed over 2 hours because a pedestrian thought they were bigger and faster than a 7 car passenger train! I did make it to Stockton in time to see the last few innings of a San Jose Giants-Stockton Ports game! Go Giants!